Please note: Before following the instructions below, you will need to copy the "app" directory from this URL (https://github.com/gudTECH/retailops_magento) into the "app" directory of your Magento installation. 1. In Magento, go to System > Web Services > SOAP/XML-RPC - Roles. 2. On the Roles page, press the [Add New Role] button. 3. Under the Role Info tab, enter the Role Name and Current Admin Password. 4. Switch to the Role Resources tab. Set Resource Access to Custom. Check the Retailops resource folder and all items within. Press the [Save Role] button. 5. Go to System > Web Services > SOAP/XML-RPC - Users. 6. On the Users page, press the [Add New User] button. 7. Under the User Info tab, fill in the required info. 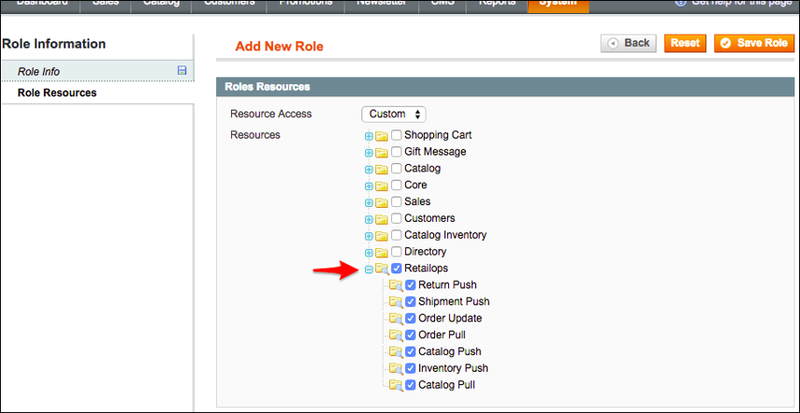 For User Name and API Key, enter the values provided in the RetailOps Channel Setup tab for the desired channel. 8. Switch to the User Role tab. Select the Role you created earlier (during Steps 2-4). Press the [Save User] button. 9. 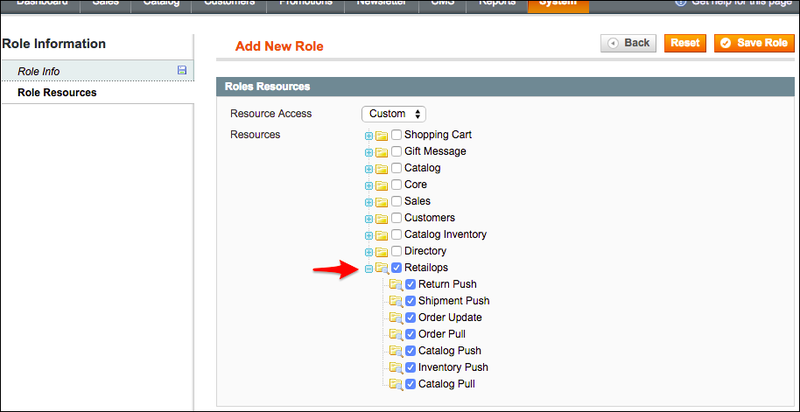 In the RetailOps web app, go to Administration > System Config. Expand the Channels pane and select your Magento channel. Under the Channel Setup tab, press the [Run Diagnostic] button to ensure that the extension is configured correctly. How do I upload product level attribute data?